Are you looking for perfectly sweet yet healthy smoothie recipes? 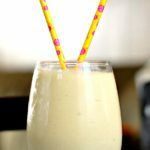 This Creamy Avocado Pineapple Smoothie recipe is filling and delicious. Now that warm weather is here, we’ve pulled out the blender and gotten back into the habit of making smoothies regularly. There is nothing better than a refreshing smoothie on a hot day! While our smoothies typically include whatever we have in the freezer and fridge that need to be used up, I like making special smoothies when I have time. We had some avocado that was about to go bad and some pineapple that was calling my name. And that’s how this Avocado Pineapple Smoothie was born. It has the perfect amount of sweetness paired with the rich creaminess that comes from the avocado. This healthy smoothie recipe makes a great breakfast, lunch or snack. Cut the frozen banana into chunks, then place all of your ingredients into your blender.